The English language and lesson plans. I think that those are the best two phrases which sum up my life at present. During this month of July, I’m training to be an English Language teacher, so that I can take this new skill and (hopefully) qualification with me to Cambodia. I’m doing the intensive 4-week CELTA course and we’ve just passed the halfway mark. In our most recent tutorials, my teaching practice group had been encouraged to try out materials in the classroom, outside of our coursebooks. On Monday we had a lesson on using ‘authentic’ texts. Texts, which are not created for the sole purpose of teaching. I felt inspired to try it out in my next lesson… which just happened to be the next day. Me, being me, wanted to try using a recipe as authentic text. We teach in pairs. Each person has 45 mins to do half of the lesson. On Tuesday, I was teaching with Rachel. We divvied out the skills and the language. I had listening and vocabulary, Rachel had writing and grammar. R: Ooh. Yes. There’s lots of imperatives and vocabulary that we could be teaching. I could get them to write a recipe to follow on. And as I had the enviable task of teaching the skill of listening, I thought that a short video from someone like Nigella would be good as they’re easily accessible on the BBC Good Food or youtube. 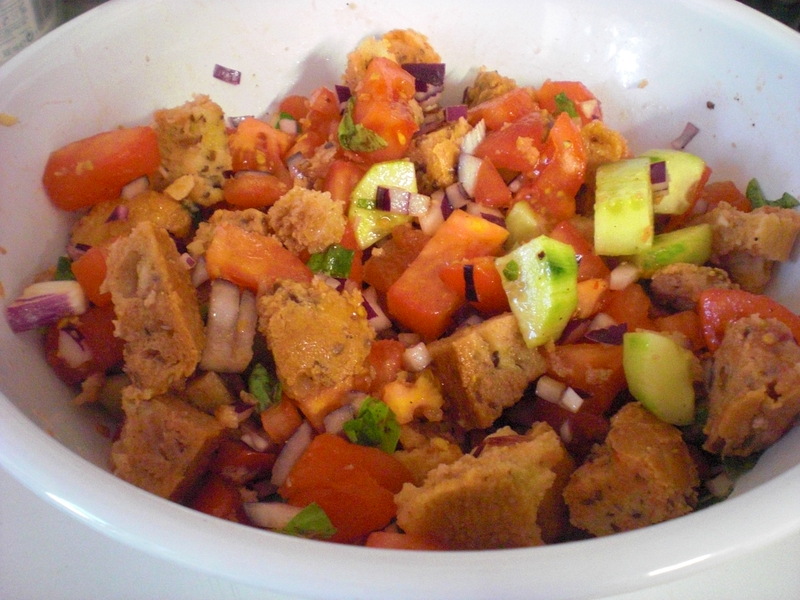 And this is how I came to be teaching 14 students, a recipe on how to make a Tuscan Bread Salad called Panzanella – i mean, it’s not even an English dish! However, importantly for our group of pre-intermerdiate learners, the ingredients are few and commonly available and the method is simple. 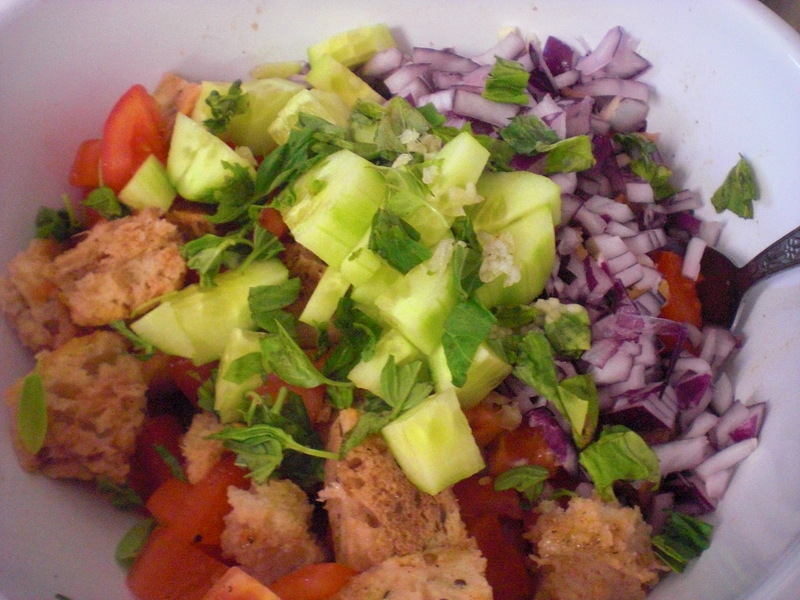 I had never heard of Panzanella until I watched Simon Hopkinson’s, A Good Cook, a few years back. I’ve raved about him before to you, haven’t I. I love his recipes and they have been really doable to recreate. 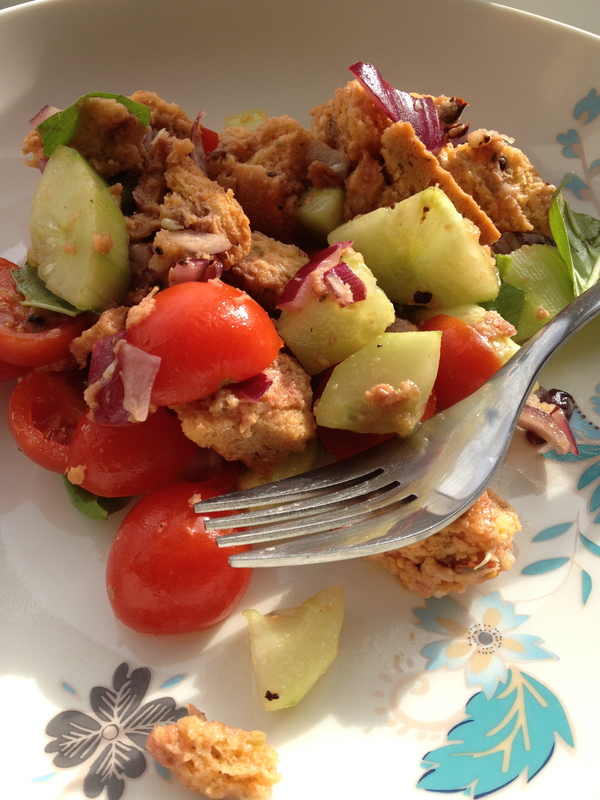 Panzanella has become my favourite taste the summer salad: the one that I make when I want to taste a bit of sunshine, regardless of the weather outside. The difference in flavour imparted by sun-ripened tomatoes and good extra virgin olive oil sets it apart. It’s also simple to make, healthy, easily adaptable to other ingredients and filling because of the bread. Have I sold it to you yet? I’ll continue. How about, it’s a great way to use up any stale bread and it uses ingredients that you’re likely to have knocking around in your fridge and cupboards? 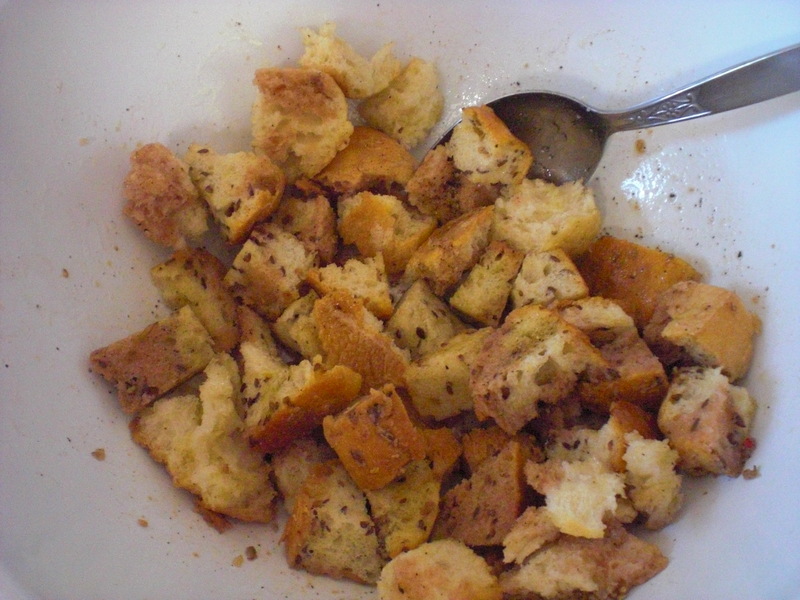 Tear the bread into small pieces and put it into a bowl. The best bread to use is sourdough bread, but you can use any stale bread. Season with salt and pepper. You can always add more seasoning later on. Add the olive oil and red wine to the bowl. You don’t have to add in all the olive oil, if you want to be a bit healthier. Put the tomatoes into another bowl and pour boiling water over them. This helps the skin to come off. Remove the tomatoes from the water. 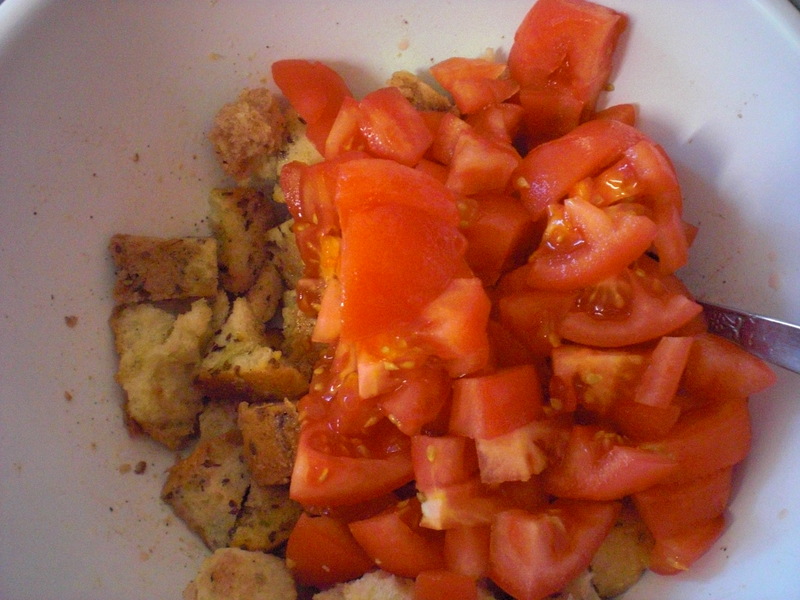 Peel off the tomato skins and cut the tomatoes before adding it to the bread. If you want to be simplify this step, then you can get away with not removing the tomato skins or use the equivalent weight in cherry tomatoes. I like removing the tomato skins, not just for the therapeutic value but also, because it softens the feel of it in your mouth when you eat it. Peel a cucumber and cut it into small pieces. Add it to the bread and tomatoes. 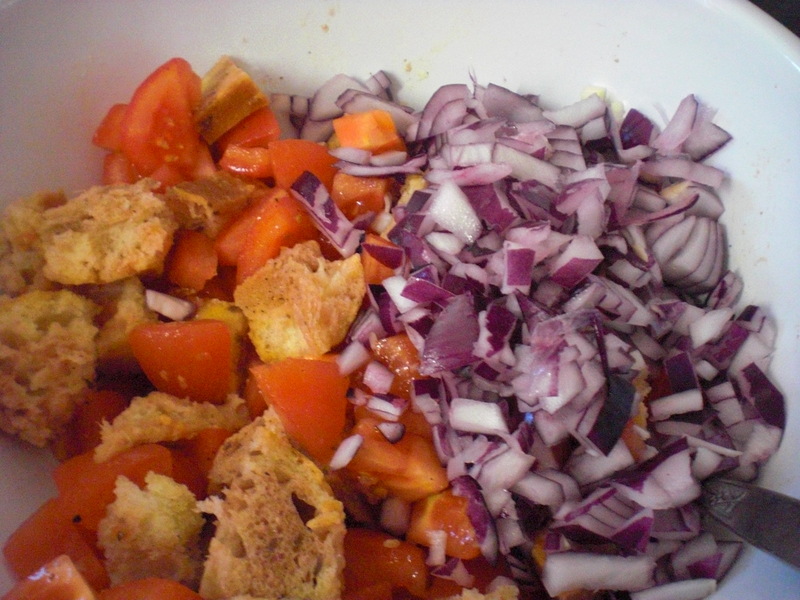 Cut the onion into thin slices and add it to the bread. Try using red onions or shallots because they are milder in flavour. Finely cut or crush the garlic cloves before you add them to the salad. You could reduce the number of garlic cloves if you don’t want such a strong flavour. Tear up the basil leaves. This is essential and you must not miss them out! Finally, mix up the ingredients. I’d suggest mixing them up with your hands because it always tastes better when you do. You could serve this on a hot summer’s day for lunch with friends, or on any day that you want a taste of summer. Don’t forget to pair it with a fruity red wine. And how was the lesson? (I don’t normally ask that at the end of a blog post on food! Told you my life is about the English Language and lessons plans at the moment.) The panzanella video with Simon Hopkinson went down really well with the learners, they learned some new words but then I got unexpectedly bogged down for 5 minutes trying to explain basil to the group. I learned that asking, “What is basil?” is relating noise to notion (there’s some TEFL jargon for you! ), and that is not the way to do teach new vocabulary! I ran out of time to do all the planned activities because of my basil moment, so I wasn’t too sure how it had gone when I finished my part. The group did appear to be enjoying the subject matter, even with it being Ramadan. Then in Rachel’s part of the lesson, I was delighted when the learners reproduced the vocabulary in the recipes and produced some really detailed, high quality writing in their recipes. In fact, our observer really praised Rachel and me on our learners’ outputs. Well done, pre-intermediate class in room 118! This weekend I have an assignment to write and a lesson to plans, so I’d better get back to it. I leave you with this one question – how would you describe/define basil to english as a foreign language learners? I have a newest favourite ingredient. Buttermilk. Who would have imagined that buttermilk would hold that honoured position? Not only is it my current fad, but learning how to make my own buttermilk has felt liberating. I no longer feel like there’s a barrier stopping me from baking a recipe because buttermilk is ‘another ingredient that I don’t have’ or ‘where can I buy that from?’ when I come across it in a list of ingredients. Since discovering how to make my own cultured buttermilk, my oven has been turning out soda bread, raspberry and buttermilk cake and vast quantities of Allinson’s Banana Cake. I first came across it when baking scones for an international tea party for 300 students. A friend of mine recommended Delia’s buttermilk scone recipe to me and every single batch turned out great. They rose perfectly and were springy in the middle. Then, I made the banana cake that was on the back of the self-raising flour packet with the leftover buttermilk. Wow – that turned out to be a winner too. Buttermilk is the liquid that is leftover from the butter making process. Cultured buttermilk that is commonly sold in supermarkets today is curdled, sour milk. I know… I’m really selling it to you, aren’t I? Appetising, it does not sound. However, it is a lovely ingredient when you use it in baking because you’re pretty much guaranteed lightness and a good rise. When I researched the chemistry, I was told that the acid in the buttermilk reacts with the sodium bicarbonate to release carbon dioxide. Those large bubbles help the mixture to rise quickly. Oh, and means you can bake soda bread within an hour from start to finish. 2. Add 1 tbsp/15ml of white or cider vinegar or lemon juice to 225ml/8fl oz of milk (preferably whole, or at least semi-skimmed) and wait about 10-15 minutes for it to curdle. This is the much easier way. Essentially, buttermilk is curdled, sour milk. I prefer to use lemon juice because the smell is that wee bit more safer when baking a sweet cake, but it doesn’t matter really. I experimented, as you’d expect me to, with whether the fat content of the milk makes a difference. I think it does. Full-fat milk will curdle better. My results with skimmed milk were disappointingly watery. Those of you who are lactose intolerant or vegan will be pleased to read that you can make it with unsweetened soya milk too. It just needs a bit more vinegar/lemon juice. I’m still chuckling to myself, as I write this, because it is a random ingredient to get excited about. Oh, I should also add that Miss Buttermilk comes as a pair with Mr. Bicarbonate of Soda. Okay, so who knows about substituting vinegar for eggs in baking already? I’m sure that this baking tip is one that many people are aware of. However, I’d only heard of it 18 months ago and it’s taken me that long to be brave (or eggless!) enough to try it out. So, I thought that I’d blog it to promote even more uses of vinegar. A friend of mine told me that a tablespoon of vinegar can be a substitute for an egg in baking. Admittedly I had quite a few questions and was a bit sceptical about it. Such as, what kind of vinegar can I use – malt, white, red or any? How does it work? And concerned about how a cake would taste with vinegar in it. Anyway, when baking Nigella’s Clementine Cake recently, which asks for 6 large eggs and I only had 5, I decided to give it a go since the clementines had the potential to cover up the vinegar taste. Quick google search (don’t I love it!) gave me enough details to give it a go. So, in answer to my questions. I’d recommend using a tablespoon of white or cider vinegar with a teaspoon of bicarbonate of soda too as a substitute for an egg in a recipe. Only use vinegar as an egg substitute when there’s a rising agent in the recipe, such as baking powder or self-raising flour. Perhaps someone knows more and could tell me more about the chemistry of how it works, please? The only thing I gleaned is that when bicarb of soda and vinegar mix, it reacts to produce carbon dioxide, which is a gas and fizzes. Is that what makes it rise? Here’s what it looks like when it mixes. ss cooking website and vinegar cake recipes… Perhaps, I’ll try them out another day!